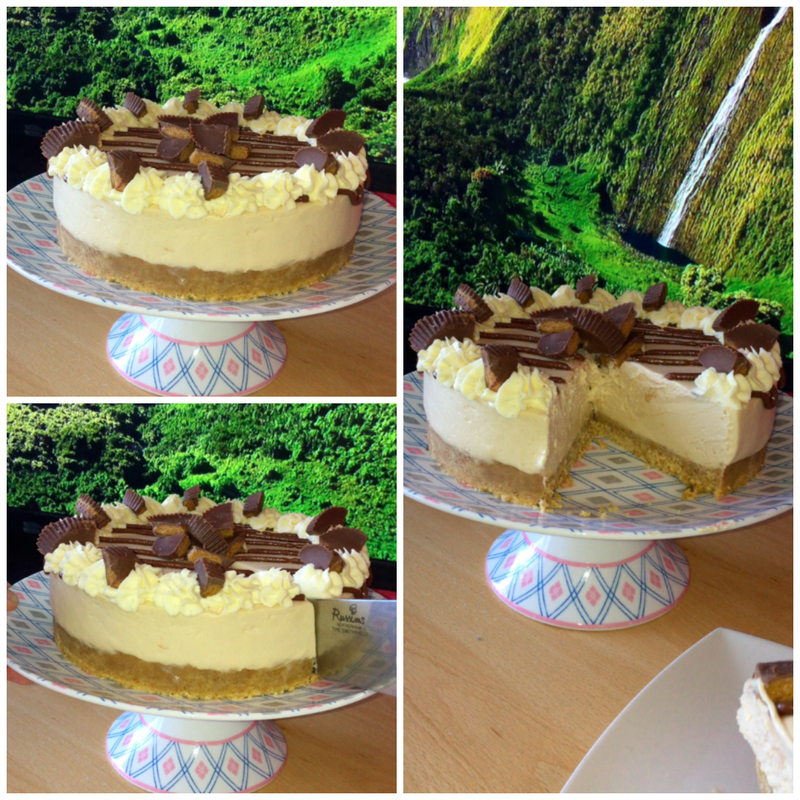 Are you looking for a no-bake cheesecake with a difference this holiday period? Look no further, I have you covered. This mincemeat cheesecake is both festive and weird because why not? If you know me and my baking (or no baking) habits, you’ll know that no-bake cheesecakes are one of my favourite things to make and eat, simply because of how easy they are to make and simple they are to make. Today’s cheesecake is well… possibly the weirdest flavour combination possible. Mincemeat is somewhat like marmite, you love it or hate it – most people hate it. I like mincemeat and cheesecake so why not have a crossover between the two? Have I taken it too far? As with all cheesecakes, it’s all about the base. I used a spiced digestive biscuit base, I’m not sure these exist but it’s just a combination of ground spices and digestive biscuits. As usual, you blitz the two together, then add the melted butter and blitz again to combine. You can do this using a food processor or place the biscuits and spices into a food zip bag and use a rolling pin to crush the biscuits, transferring the biscuit crumb into a small bowl, adding in the melted butter and giving it a mix with a spoon or silicon spatula. Use whichever method works best for you. Transfer the buttery biscuit base into a deep sided 8-inch cake tin, you can line the base if you’d like too. Once all the buttery biscuits are in the tin, you’ll want to press them down as best you can using either a cup measurement or the back of a spoon until its tightly packed into the base of the tin. Place in the fridge and allow to chill in there while you make the cheesecake filling. To make the cheesecake filling is super easy, into a large bowl place your soft cheese, mincemeat and spices and mix them all together using a whisk. 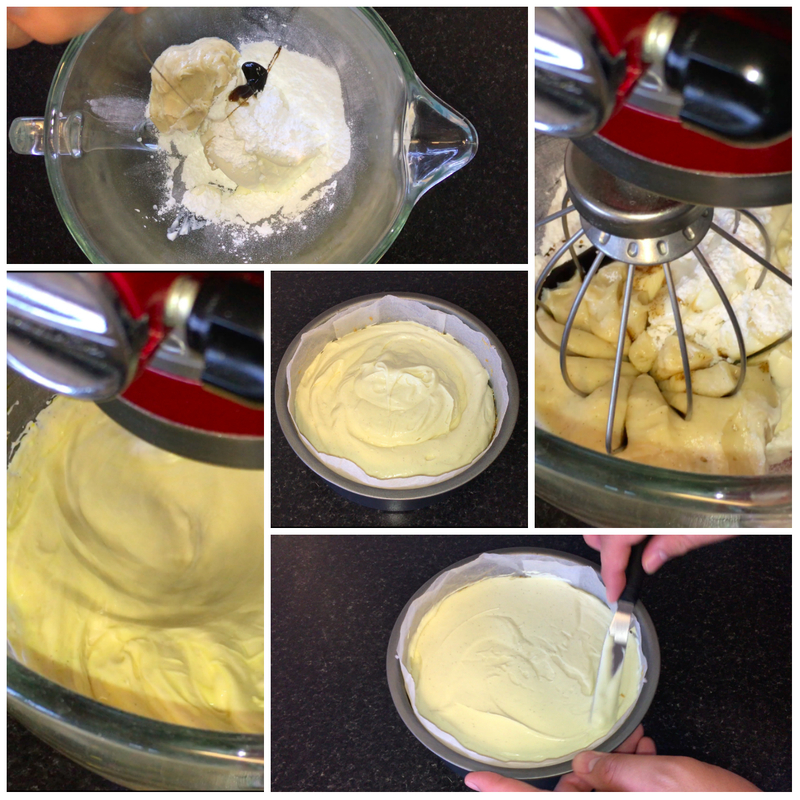 Keep whisking it together until it’s all come together and is well combined, then you can add in your double cream and whisk it into the mixture until it’s become thicker in consistency and can hold it’s own shape. Place the cheesecake filling on-top of the biscuit base, once it’s all in the tin, try and level it off as best you possibly can using a small offset palette knife or the back of a spoon, once level, set in the fridge and allow to chill for around 6-8 hours (or overnight). The next day, remove the cheesecake from the tin and place it onto your plate or cake stand of choice, now it’s time to finish/decorate the cheesecake. I kept it simple by piping rosettes of fresh cream all the way around the edge of the cheesecake and place a good amount of mincemeat in the centre but feel free to finish the cheesecake however you like, it’s yours to customisable. 600g Soft cheese (full fat). Weigh up all your ingredients and line your tin with parchment paper (if you choose to use it). To start on your cheesecake, you’ll want to start on the base. Crush your biscuits into crumbs using either a food processor or a rolling pin and a food zip bag. Melt some butter in a saucepan over a low-medium heat or in the microwave, then add to the biscuit crumbs and mix them together until they are fully worked together. Transfer the biscuit mixture into the cake tin and press it down using a cup measure or the back of a spoons will work equally as well. Press down the mixture compressing it well. Start on the cheesecake filling by placing the soft cheese, mincemeat and spices into your mixing bowl of choice and whisk them all together until they are fully incorporated. Add in all of your double cream and whisk until the mixture is thicker in consistency, if you’re doing this by hand, you’ll notice that the mixture becomes “heavier” to mix. Once you’ve got the filling thickened, place it on top of the biscuit base and level it off as best you can using a small offset palette knife or the back of a spoon should work as well. Set the cheesecake in the fridge and allow it to chill there for around 6-8 hours. The following day, I removed the cheesecake from the cake tin and set it on my plate (feel free to use a cake stand or board, if you’d prefer. 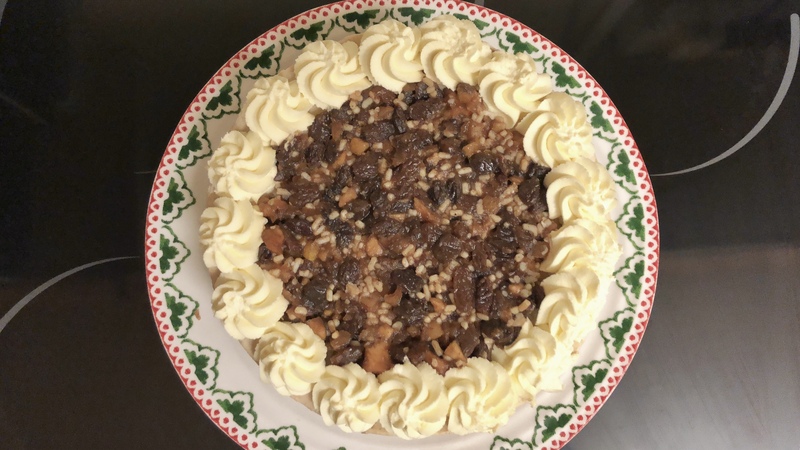 To finish the cheesecake, I pipe rosettes around the edge and fill the centre with mincemeat – this is fully customisable so feel free to make it work for you. 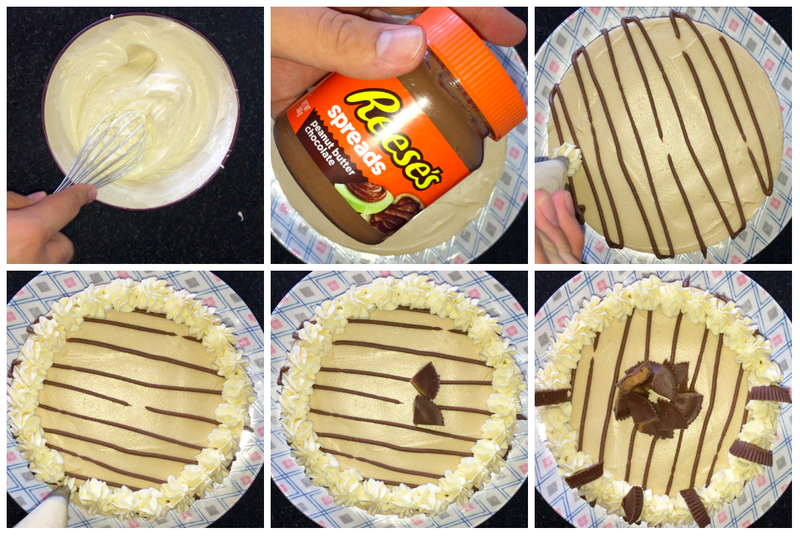 Thank you for checking out my recipe for this (weird) chreesecake recipe – I hope you get to make it soon. If you’ve come looking for either a Reese’s or peanut butter cheesecake which is no bake, then you’ve come to the right place. The recipe I’m about to share with you is super simple and takes no time at all and best of all, it requires no oven! As mentioned above, if you’ve been looking for the perfect peanut butter no bake cheesecake then this recipe may be for you. This cheesecake is compromised of a classic buttery biscuit, topped with the creamy and rich cheesecake, which is perfectly flavoured. The peanut butter flavour is there just right for me, it’s not overwhelming or underwhelming but feel free to adjust the amount of peanut butter to suit you and whoever you intend sharing this cheesecake with. My guess is if you’re looking at this cheesecake, then you quite like peanut butter and the amount I use will suit you well. Anyway, I then finish my cheesecake with a good amount of Reese’s chocolate peanut butter spread (if you like normal peanut butter, then this is a whole other spread, you must try asap!! ), then I pipe sweetened whipped cream around the edge of the cheesecake and finish with a generous amount of quartered peanut butter cups. There’s quite a bit of peanut butter involved, isn’t there… Oh well, just have a smaller slice. May as well enjoy it in the moment. 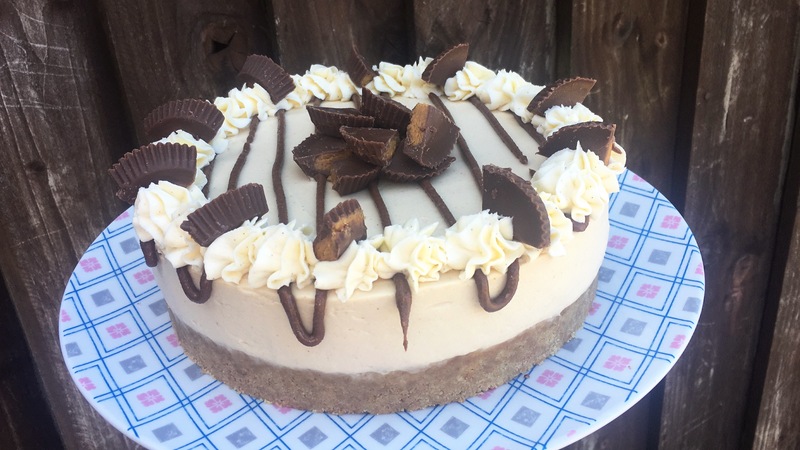 When I was making this cheesecake, the United Kingdom was experiencing some sort of heatwave (it could well have been summer weather but we don’t have weather like that too often, so meh. I don’t know still.) and even here in Birmingham, it was reaching highs of 31˚c/88˚f which was a little too warm for me, so a majority of baking (and no bake desserts) were being made when it was slightly cooler in the evening, it was still too much with the oven at 180˚/350˚f… Anyway, this isn’t a weather report. If you haven’t guessed already, trying to keep a no bake cheesecake cool in the warmer weather isn’t that easy. Although the cheesecake didn’t melt completely there was a couple of close calls when I almost dropped it when transferring it back to the fridge one I had removed it from the tin or when it came to slicing it up, it kinda looked like it had been in the sun… Oops, it still tasted pretty good though, I’m not going to lie. The process behind making this cheesecake isn’t so hard, the most difficult thing about this cheesecake is waiting for it to firm up in the fridge or deciding how to decorate it. 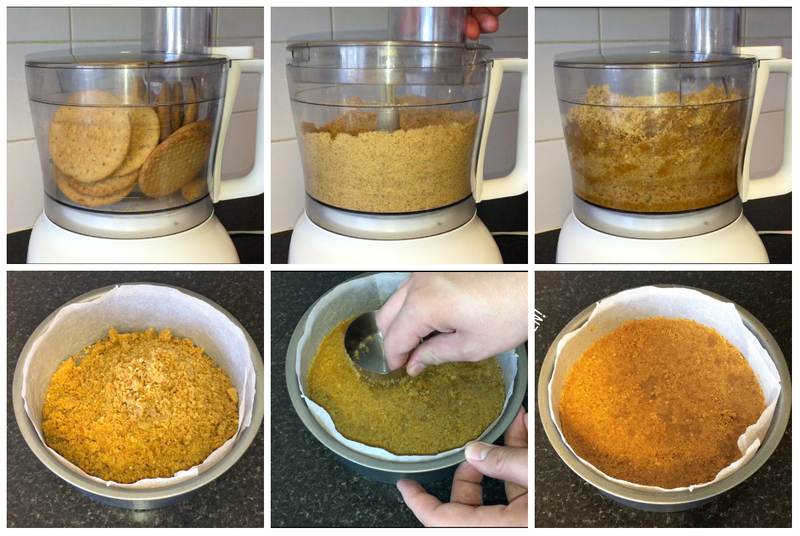 To make the biscuit base, you only need 2 ingredients and if you don’t have fancy equipment, don’t worry. All you need to do is crush the biscuits until they are a breadcrumb consistency or sand consistency and you can choose between the two methods on how to do it. Method 2 would be to place your biscuits into a food processor and blitz them together until they have broken down enough and look like breadcrumbs or sand and method 2 would be to place your biscuits into a food safe bag and securing the end. Then bashing the crumbs with a rolling pin until the biscuits have been bashed enough and they resemble either breadcrumbs or sand. Add in the melted butter (feel free to melt it in the microwave or in a saucepan over a medium heat until just melted) and mix the 2 together until it starts to look like wet sand (thats the best way I can describe it really. Transfer the buttery biscuit mixture from your food processor or food safe bag and place in the bottom of your 8 inch round baking tin and press it down using a cup measurement or whatever you have (a spoon works really well too!). Once the base is level, place the tin in the fridge and allow to chill and firm up while you make the cheesecake filling. 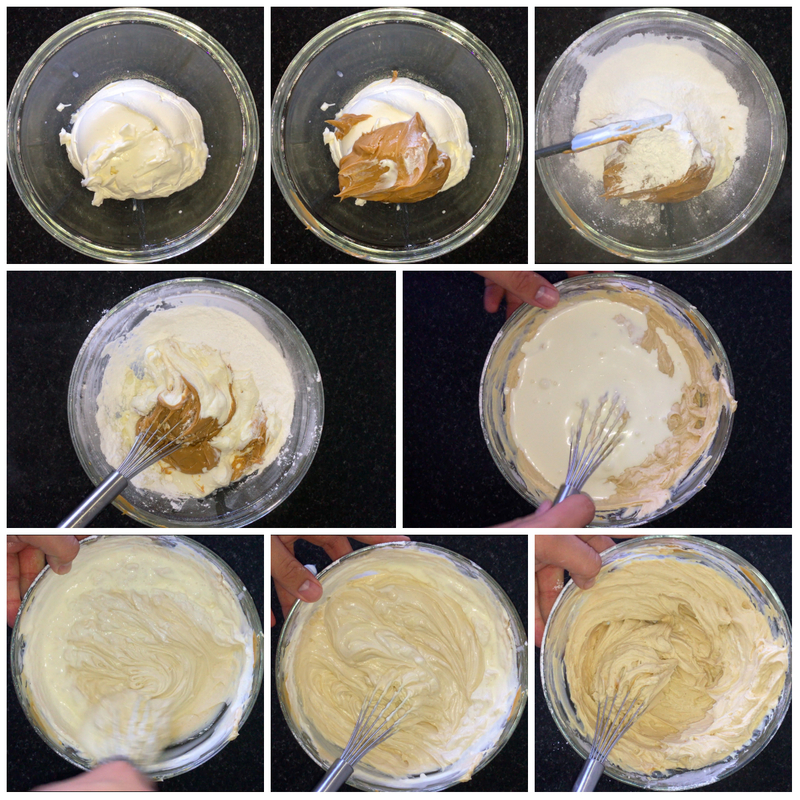 To start the cheesecake filling, get yourself a large mixing bowl (or use a stand mixer bowl, whichever you have or prefer) and place the soft cheese, peanut butter and icing sugar and using a whisk, whisk it together until its all come together and is well combined. This will only take a few minutes, depending on how quickly you’re mixing it together to be honest with you. Once you’ve achieved this, you can then add in your double cream and again whisk the mixture until the double cream has been completely worked in. This again varies on how quickly you’re whisking the mixture together. You will be able to both see and feel the cheesecake filling thicken as the double cream is worked in, it will hold its shape pretty well once whisked enough. Just be careful not to over-mix at this stage, otherwise your cheesecake will be too stiff. Once the cheesecake filling is done, you will then want to place the cheesecake filling on top of your buttery biscuit base, getting as much as that rich and creamy filling into the tin as possible. Level it off as best you can using either a silicon spatula or a small offset/cranked palette knife (I recommend one of these, they are a life saver when it comes to baking! ), I like to level the top off so its as smooth/level as possible, it makes it look better and helps when it comes to decorating. You can then transfer the cheesecake to the fridge and allow to chill for 8 hours or overnight until set (I left mine overnight, so I recommend doing this to you also). So, the following morning I removed the cheesecake from the fridge and removed it from the tin, transferred it to a cake stand and placed it back in the fridge while I prepare my final decoration bits and pieces. I required some cream for the edge of my cheesecake, so I placed my double cream, icing sugar and vanilla into a bowl and whisked that until it was thicker and placed into a piping bag with a closed star piping nozzle. I placed a couple of tablespoons of the chocolate peanut butter into a separate piping bag, fitted with no nozzle and chopped my peanut butter cups into quarters and placed them into a bowl. Now I have all the final bits and pieces I need for my cheesecake, I can finally get on to finishing it. To finish the cheesecake, you can do it however you like. It’s really easy to customise and make it suit your occasion. My cheesecake wasn’t for any special occasion, so I didn’t have a theme. I piped over a ‘drizzle’ effect with the chocolate peanut butter, then all around the edge of the cake I pipe small amounts of whipped cream. To finish I place a few of my quartered peanut butter cups in the centre, then place the odd quarter onto the whipped cream around the edge. This cheesecake is really easy to make and doesn’t require a lot and best of all its no bake and can be made ahead, so why not whip one of these up soon? 1 tsp Vanilla bean paste. 2-3 tbsp Chocolate peanut butter. A few peanut butter cups, quartered. Place your biscuits into a food processor or food safe bag and blitz/beat until the biscuits become a sandy consistency. Melt you butter either in the microwave or in a saucepan over a medium heat, then add into the biscuit crumbs and mix until the crumbs are all coated and look like wet sand once well combined. 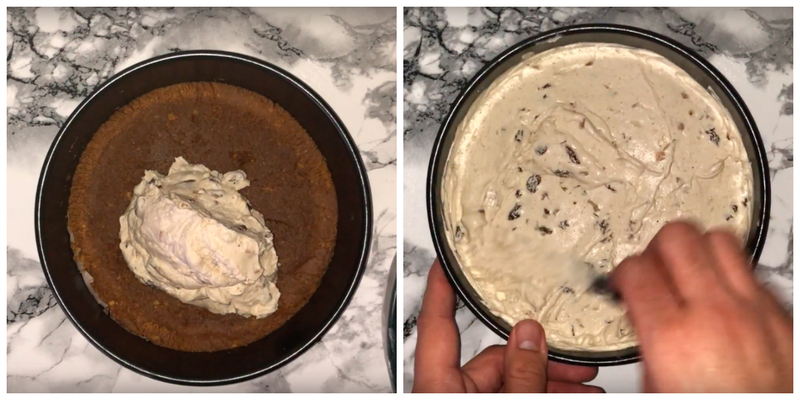 Transfer the biscuit mixture to your 8 inch round cake tin and press it down using either a cup measurement or the back of a spoon until the base is level and smooth looking. Place in the fridge, so the base can firm up and you can get on with making your cheesecake filling. To start, get yourself a large bowl and place your soft cheese, peanut butter and icing sugar. Whisk the 3 together until the mixture comes together, this may take a couple of minutes (it all depends on how quickly you’re mixing them together). You will know once its come together, it will be one solid colour and not a trace of a single ingredient. Add in your double cream and again whisk the mixture together until it becomes thicker in consistency and it holds its shape well (you will be able to see and feel the difference once its combined. Try not to over-mix at this stage). Transfer the cheesecake filling and place it on top of the buttery biscuit base you made earlier on, getting as much of the cheesecake filling into the tin as possible. Level it off as best you can using either a silicon spatula or my favourite, a small cranked palette knife. Once you’ve levelled the top off as best you can, place the tin into the fridge and allow to chill and firm up for around 8 hours or overnight for the best results. To start on the toppings, place the whipped cream, icing sugar and vanilla into a bowl and whisk together until its well combined and holds its shape well. Transfer the mixture into a piping bag fitted with a closed star piping nozzle. Place a few tablespoons of chocolate peanut butter into a piping bag, with no tip. Cut a few peanut butter cups into 4’s and place into a bowl. Remove the cheesecake from the fridge after 8 hours and place onto your cake stand or plate of choice and place back into the fridge to chill while your prepare your toppings. Decorate your cheesecake however you like, it’s easy to customise it at this stage and feel free to use more or less of something. Make it suit your occasion best. Many thanks for stopping by, I hope you enjoyed. Don’t forget to check out my other recipes, if you’d like. Today’s recipe is for another no-bake cheesecake, it could be considered two desserts in one. Who doesn’t want more dessert? This recipe is perfect if you’re currently experiencing the warmer weather, its no bake, so you won’t be getting hot in the kitchen while you make this. You can get this cheesecake made in under 60 minutes and seeing as it doesn’t require baking, you only need to chill it in the fridge for a minimum of 4 hours or overnight for the best results. I’m not going to lie, this was a random accidental creation. I saw the trifle kits in the supermarket and was buying the ingredients for a cheesecake and thought about doing a combination of the two a trifle x cheesecake but wasn’t sure how I was going to make it work. I got home and spent sometime working out how I could incorporate the different elements to make this combination work, not long after I had got the idea of how to make it work. So, working from the bottom up, it would compromise of a traditional buttery biscuit base, topped with a vanilla crème pâtissière/pastry cream cheesecake filling, which is topped with a strawberry jelly topping and finished with freshly whipped cream and sprinkles. It’s a completely different flavour to what I’d normally do but thought why not try a combination? Before you can consider making the cheesecake, there is some prep work to be done so that everything can be made in order. You’ll want to make your crème pâtissière/pastry cream in advance so it has time to cool, this is pretty simple to make and doesn’t require many ingredients. Start by placing your milk and vanilla extract/bean paste into a saucepan, giving it a whisk together, then allowing to come to a boil. While you wait for your milk to come to a boil, place your egg yolks and sugar into a bowl and whisk them together until lighter in colour and thicker in consistency then add in the flour and whisk until well combined. Once your milk has reached a boil, add between a 1/3 and 1/2 the milk, whisking constantly, this is to temper the egg yolks and prevent them from curdling. Add the other half of the milk giving it a good whisk, then return the milk mixture onto the heat, lowering the temperature a little and constantly stirring the mixture until it thickens. Take the time to stir this as you don’t want it to catch on the bottom of the pan, this will ruin your pastry creme. Remove from the heat and transfer to a bowl or to a baking tray, covering the pastry cream with cling film (so it doesn’t form a skin) and allow to cool completely before using it (the thinner you can spread it out, the quicker it will cool). Don’t forget to line the sides of your cake tin, regardless of the type of tin you’re using. For the cheesecake part, it’s just like any of my other cheesecakes. You’ll want to make the base first, followed by the filling and then the topping, pretty simple right? The base is made up of 2 simple ingredients, digestive biscuits and butter. You will want to break the biscuits down until its become a crumb or sand like consistency, either using a food processor or a plastic food bag and rolling pin. Next you’ll want to melt the butter. You can do this 2 ways, either placing the butter in the microwave and microwaving until its melted or you can melt it in a small saucepan over a medium heat and stir it to help it melt, regardless of which method you use, allow it to cool down slightly before you intend to use it. Add the melted butter into your biscuit crumbs and mix the two together until they are well combined, it will look like wet sand. Place the buttery biscuit mixture into the base of your 8″ cake tin and press it down using a cup measurement to get it compressed but feel free to use a spatula or spoon. Place in the fridge while you make your filling. To make the filling, you’ll want to place the soft cheese, pastry cream, icing sugar and vanilla into your bowl and beat them together over a medium/high speed until it’s well combined, seeing as the custard powder you’d get in the trifle mixes would come out a yellow-ish colour so I added enough yellow food gel to get a brighter yellow colour but feel free to leave this out if you don’t want to include it. Scrape down the sides and bottom of your bow to fully incorporate any bits that wasn’t from earlier on. Add in all of your double cream and whisk together over a medium-high speed until the mixture has become thicker in consistency. Scrape down the sides and bottom of your bowl again, then remove your base from the fridge and place the cheesecake filling on top of the base, levelling it off as best you can using a small offset spatula, spoon or spatula and then set in the fridge while you make the jelly topping. This is probably the easiest step to do. get yourself a strawberry jelly from the supermarket, I found mine in the dessert section in the supermarket. I just followed the instructions on the back of the package which was just to dissolve the jelly in boiling water, stirring then adding cold water and stirring again, it’s really that simple. I then pour this mixture on top of the cheesecake and chill for a minimum of 4 hours or overnight for the best results. The following day I removed the cheesecake from the fridge and removed it from the tin. I then place the cheesecake onto a plate of choice and then you can finish it using a small amount of freshly whipped cream and some 100s and 1000s. Then slice yourself a portion and enjoy it! 1 tsp vanilla extract or vanilla bean paste. Place the milk, vanilla extract or vanilla bean paste into a saucepan and bring to a boil over medium-high speed. While you wait for the milk to come to a boil, you can whisk the egg yolks and sugar in a separate bowl until they have become thicker in consistency and lighter in colour. Once you’ve achieved that, add in your flour and mix until smooth. Once your milk has reached a boil, pour in between 1/3 and 1/2 and whisk the milk and egg mixture together, this is to ultimately ‘temper’ the eggs then add the remaining milk to the mixture, whisking well. Then transfer the mixture back to your saucepan and return to the heat, lowering the temperature slightly. Once you’ve got your saucepan back on the heat, constantly stir it using a silicon spatula or a whisk until the mixture has become thicker, then remove from the heat. Off the heat, you’ll want to transfer your pastry cream to a bowl or baking tray (the thinner you spread it out, the quicker it’ll cool down) and allow cool completely. Don’t forget to cover the pastry cream with cling film to prevent a skin from forming. The pastry cream you made. 1 tsp Vanilla extract/vanilla bean paste. Line the sides of cake tin and melt the butter either in the microwave or on the hob, set aside to cool slightly. Crush your digestive biscuits down until they reach a crumb/sand consistency, using either a food processor or a plastic food bag and a rolling pin, then add the melted butter and mix until it resembles wet sand. Place the mixture in to the bottom of your prepared cake tin, compressing it down using a cup measurement or something similar. Set in the fridge while you make your cheesecake filling. To start on the cheesecake filling, place the soft cheese, pastry cream, icing sugar and vanilla into your mixing bowl and beat them together on a medium-high speed until they are all well combined. It’s here that’ll you want to add your yellow colouring, if you’re using it. Scrape down the sides and bottom of your bowl, to incorporate any parts that may not have been fully worked in. Pour in all of your double cream and incorporate this by whisking it on a medium-high speed until the mixture has become thicker in consistency. Scrape down the side and bottom of your bowl again, then transfer the filling into your cake tin, on top of your buttery biscuit base. Level/smooth off as best as possible using a small offset spatula or spoon. Set in the fridge while you make the jelly topping. 1 package of strawberry jelly (follow package instructions for the best setting results). A couple of sponge fingers, chopped. 100s and 1000s (or your choice of sprinkles). Make your jelly but following the instructions on the back of the package, this will achieve the best results. Pour this mixture on top of your cheesecake and place a few bits of the chopped sponge fingers into the jelly, pushing them down into the cheesecake so they’ll stay in place. Place in the fridge and chill for a minimum of 4 hours but I recommend leaving it overnight or for around 8 hours for the best results. Once you’ve removed your cheesecake from the fridge, remove from the tin and discard the parchment/greaseproof and place onto your place or stand of choice. The finishing of the cheesecake is completely up to you, I piped small amounts of freshly whipped cream onto the cheesecake but feel free to spread an amount of it on top instead, if you wanted to get a more authentic trifle looking finish. I then sprinkle on some 100s and 1000s and I’m done. Cut yourself a slice and enjoy. This recipe doesn’t require a lot in all honesty, its just the time it takes to set which is the major downfall, however its all worth it. If you are looking for a summery recipe that doesn’t require any baking, I have the perfect recipe for you. 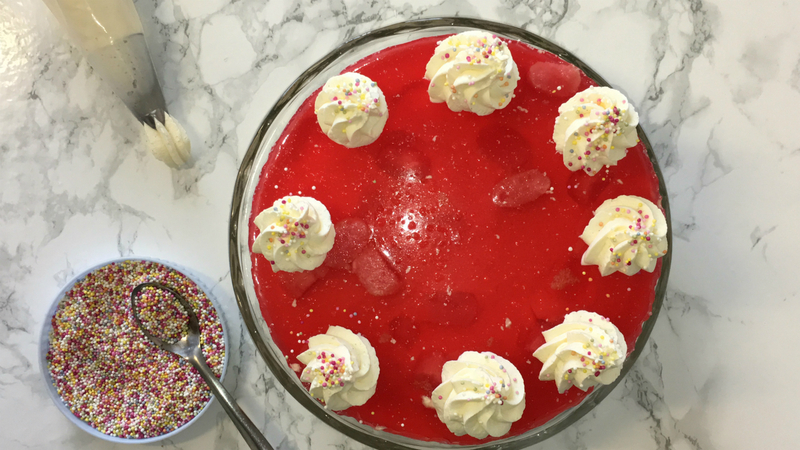 I’m showing you how to make a strawberry and white chocolate no-bake cheesecake – even better there is no gelatine in this recipe. What’s not to love? As mentioned above, this recipe is perfect for the summer season. It’s bursting with flavour, the combination of fresh strawberries and white chocolate is always a winner but even more so with this cheesecake. 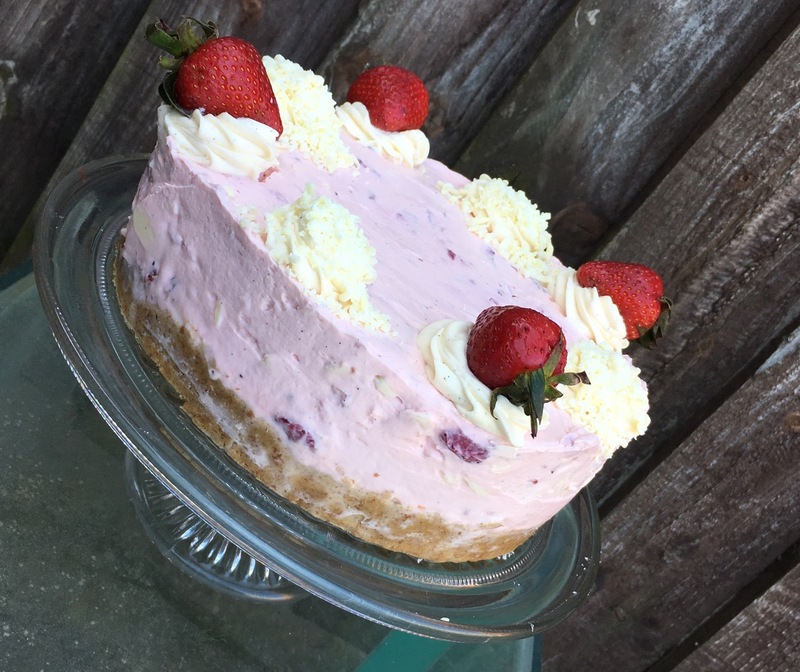 Don’t worry about adding fresh strawberries into this cheesecake, it won’t change the consistency at all – it just enhances the natural flavours, meaning you don’t have to add any artificial flavourings. Now isn’t that great? This cheesecake doesn’t require many ingredients or a lot of time to make it, the only drawback is it takes time to set. 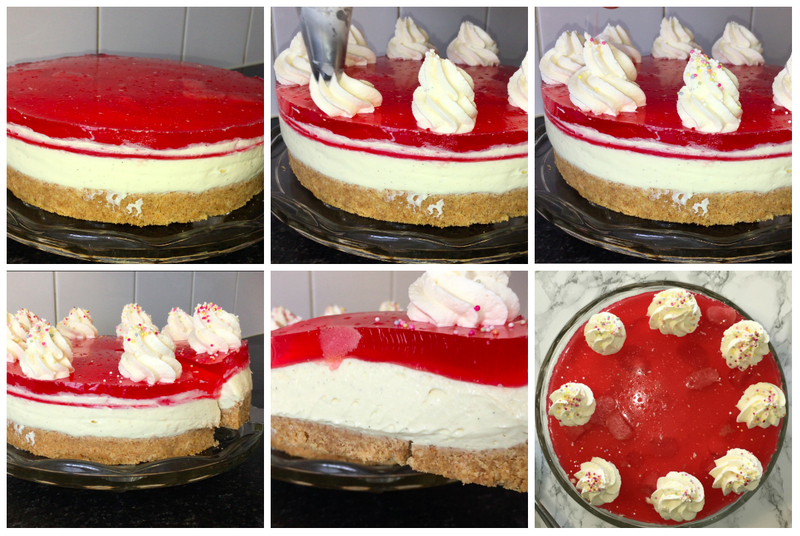 I find that cheesecakes set in 4-5 hours but leaving them overnight will yield you the best results – thats the best advice I could give you when it comes to making any no-bake cheesecake! Anyway, this cheesecake has the most basic but iconic base in the history of no-bake cheesecakes, the buttery digestive biscuit base. It sure isn’t anything fancy but when you partner this with the creamy cheesecake, it’s a sure winner with almost all cheesecakes. On top of this buttery biscuit base lays the best and most flavourful cheesecake ever. It’s a simple recipe that doesn’t require many ingredients or for you to be a culinary expert to make it, just a little time and effort and you can knock one of these out! What makes these cheesecakes even better is you don’t need a stand mixer, a simple mixing bowl and whisk will make this, it just requires a little more elbow grease. Granted, I opted for a stand mixer on this occasion as I wanted to make something but wanted it to be quick and easy so this fitted the bill so well. I believe that most of the ingredients I use are available around the world, but if not feel free to leave me a comment and I may be able to help you! When I was coming up with the idea of this, I was thinking what I could partner with the strawberries. 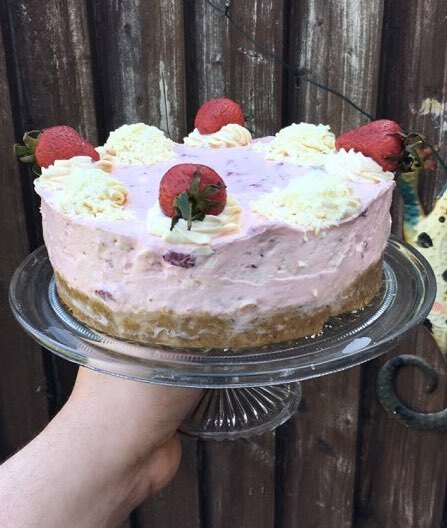 It hit me after about 3-4 hours, strawberry and white chocolate, they partner well together so why not try them in cheesecake form. To start the cheesecake you’ll want to make the base. Blitz your biscuits either in a food processor until it reaches a sandy/breadcrumb consistency, then add in the butter and mix until it looks like wet sand. If you’re doing this stage by hand, place the biscuits into a plastic food bag and bash the biscuits using a rolling pin and follow the same method as the food processor from here. 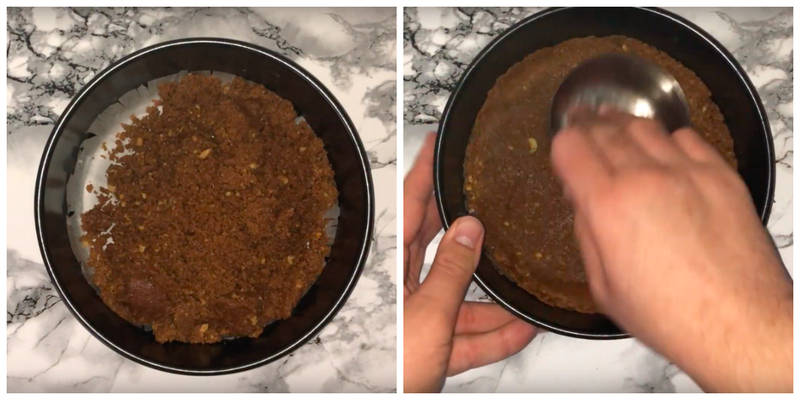 Push the biscuit base down so its compact in the base of your 8 inch/20cm cake tin and set in the fridge while you make the cheesecake filling. To make the cheesecake filling, place the soft cheese, icing sugar and vanilla into your mixing bowl of choice and mix until it’s well combined, then scrape down the sides and bottom of your bowl. Add in all of the cream and whisk this on a medium high speed until its become much thicker in consistency, once that’s been achieved you can add the strawberries and white chocolate and fold that in using a spatula until well combined and the fruit is fairly distributed. Feel free to add a small amount of food paste in at this stage, I thought mine would turn out pinker but adding a small amount of colour paste helped me achieve this. Place this mixture on top of the biscuit base and smooth it off as best you can, then place in the fridge for a minimum of 4-5 hours or preferably overnight. To finish the cheesecake, remove it from the tin and place onto a plate or cake stand. You can then pipe on small amounts of freshly whipped cream, top half of them with fresh strawberries and the other half with grated white chocolate. Then slice and enjoy – its fresh, fruit and creamy all in one mouthful. The perfect addition to any summer day. 100g White chocolate, roughly chopped. Strawberries (as many as you wish to use). White chocolate (I opted for grated but feel free to use it however you like. There is no baking required, however this cheesecake does require chilling time. Over night (8+ hours in the fridge) or for 6-8 hours before removing from the tin and slicing. Don’t forget, if you make anything using my recipes, feel free to share your creations with me over on Twitter and Instagram!